This was the sixth annual wine-tasting hosted by ING at its London headquarters. More than 50 guests attended the evening, where expert sommelier Richard Yates of Ellis Wines guided on wines sourced from countries in which the charity operates. Tributes were also paid during the evening to a much-loved Sailors’ Society staff member, Pastor Joseph Chacko, and his wife Leena, who tragically died in a road accident along with Meru Kaku, a driver at the Deendayal Seafarers’ Center, earlier this year. Joseph was Sailors’ Society’s regional superintendent for India. His vision was to see, during his lifetime, a seafarers’ center in every port and the charity has now launched a fund in his memory. 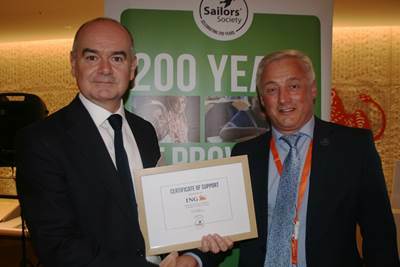 The fund initially aims to raise $130,000 (USD) towards Sailors’ Society’s work in India, where it is estimated that 70 per cent of seafarers arriving in the country are unable to get shore passes and access local amenities. Guests heard that funds raised will be used to build a seafarers’ center in the port of Haldia in Joseph’s name, as well as other projects including a counselling center, mobile medical unit and the ongoing provision of seven port chaplains.